What is electricity? Where does it come from? How does it work? In the late 70s and throughout the 80s, several electrical engineers were asked these questions. Except for some data on how electricity works in practice, nobody could answer these questions. It was difficult for Nikola Tesla himself to explain! In Harmonic Chemistry theory, based on ancient Chinese observations, electromagnetism can be seen as one of 5 natural forces in the universe, correlated with "Fire". This is a partially useful explanation, but it is still incomplete. Exactly how one sees electricity as a natural force depends largely on viewpoint, which must be considered. In fact, if you find an explanation that contradicts this one, it could be right too. Look at the overall viewpoint of an alternative explanation, and you will learn a lot. Below you see a photo of some replica equipment. On the left are Leyden jars, which were a type of storage unit; forerunners of both batteries and capacitors. Behind on the right is a Wimshurst static electricity generator. Front center are simple bells that can be arranged to detect static electricity. This is one way to illustrate the fact that many alternative concepts about electricity have existed in the past. These beautiful pieces were built on assumptions radically different from what most electrical engineers believe today. Nikola Tesla's concepts of electricity were clearly tied in with an understanding of natural and mechanical resonance. However, his terminology from patents and notes has not been widely understood. Many engineers have dismissed this original source material as irrelevant. We should be aware that the meaning and usage of many electrical terms has changed radically since Tesla's time. If we go back to his notes and try to get solid definitions for Tesla's terms, we may do better in figuring out what he was really doing. In July 2006, Peter Lindemann presented the results of many years' research into exactly what Tesla meant. The DVD of this presentation is highly recommended for anyone who wants to research and understand the fundamental nature of electricity and how it works. Get the July 2006 ExtraOrdinary Technology Conference DVD by Peter Lindemann at Tesla Tech, Inc.
After the world had mostly switched to AC from DC current between 1893 - 1898, which has been well documented in many places, he dedicated himself to creating a worldwide system that would provide free electricity to all people. This would take away any excuse for war, he wrote. A huge Tesla Coil placed at a specific type of location was key to this system. While Tesla used these for shows sometimes, the real purpose was to ramp electrical power up into a radio frequency range so it could be transmitted using the Earth itself as a component of the system. Starting in 1901 he built a laboratory at Wardenclyffe on Long Island. The tower from the lab was intended to be the first of many spaced evenly around the world. But funding was stopped, and in 1917 the tower was demolished under orders from the US Navy. Thanks to this model by Gary Peterson, we now have a proof of concept for this system. It may immediately prove useful for remote wind and geothermal systems, eventually replacing many powerlines. 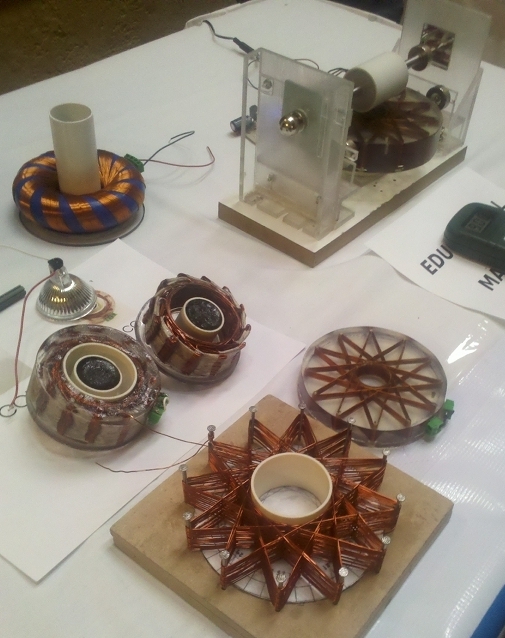 During the summer of 2011, successful demonstrations of wireless electricity transmission happened in Philadelphia and Albuquerque. These were based on patents by Nikola Tesla that are over 100 years old. We have been looking at this information for all these years without knowing what we were seeing! Now, at least three experimenters have shown that his system works exactly as patented. Most Tesla coils have been noisy. Between 1984 and today, these were mostly designed to put out maximum sparks for drama. We didn't realize that Tesla had intended for the spark output to be quenched and driven back down to Earth. This means grounding is everything in these systems, which is exactly what he said. Recent demo units since 2006 have been simple working models of wireless systems. Transmitting and receiving ends don't need to be physically identical. The receiver only has to look the same as the transmitter from the viewpoint of an electron. There must be no disturbance to the public or interference with electronic equipment. Therefore, tuning is essential. In Tesla's time, he used neon lamps to find when a pair of coils were in tune with each other. This system has especially great potential for remote wind and hydro generation sites. It doesn't care where your electricity comes from – solar, hydroelectric, wind, or even the cosmos. Remember, everything is connected to a universal sea of energy according to Tesla. It comes down to a variance in the pressures of energy. According to builder Michael Leas, “There is a living vortex and a universal spiral. Quantum physics will need to see that there is also a spiritual evolution in the sequence of the universe.” Researchers have been amazed at the connections between spiritual principles and wireless transmitters. These experiments have thus shown that whatever is being transmitted is not exactly electricity, although we can extract electricity easily from it. Any good tinkerer can build these in a garage. Several wireless transmission and receiver units built by Michael Leas. This photo has been deliberately kept at a large size so you can scroll to examine construction details. At this point, we don't know for sure what the transmission range of these units can be. We also have more experiments to do in regards to radio emissions, although so far this has not been the problem we expected. Apparently what is happening is that the waves put out by these transmitters are very different from radio or electricity. We can call them Tesla Waves, and they have more in common with sound than with any kind of electromagnetism. Many potential applications for this technology are already proposed. One obvious one should be stated here since it can alleviate significant suffering, especially in the Third World. Think of a hilltop where wind blows constantly. Nearby is a valley where villagers struggle to keep crops irrigated from one month to the next. Either there is no electricity available at all, or it is more intermittent and expensive than wind. A wind generator can be made from two halves of an old oil drum. It's not the most efficient thing in the world, but it's good enough. It can be harnessed to a transmitting coil. Down in the valley, a matched receiving coil can translate the Tesla Wave into electricity. From this time on, irrigation can happen at some of the most urgent times, when wind is blowing over the hills and surrounding valley air is especially dry. Nobody would be forced to spend money they don't have on a powerline from the hilltop to the valley. Other applications like this are possible. A recent book The Boy Who Harnessed the Wind by William Kamkwamba and Bryan Mealer provides a good perspective on how such a system might be built. Another technology with the potential to make a huge difference in the way we use electricity is called Rodin Coils, named after inventor Marko Rodin. Putting his name into the search bar of YouTube will bring up many videos showing how to make and use these. New developments are literally happening every day since a number of researchers are working on this technology.